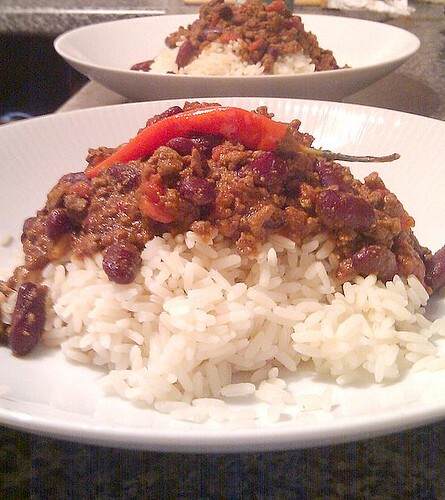 Claire’s Cake Bake and Other Foodiness » Blog Archive » The Perfect Chilli Con Carne? Anthony has been asking for a Chilli for ages and I keep making excuses. Its not that I dislike it, its just that I tend to prefer other things for dinner. Tonight he eventually got his way and made his own after some research for a good recipe. That is when he came across an article on the Guardians Word of Mouth Blog – How to cook the perfect chilli con carne. He quickly decided that he wanted to make the perfect chilli con carne but we did find it difficult to source the ingredients and we swapped the speciality chillis for a hot red one & some dried chilli flakes, Mexican oregano for dried oregano and we forgot the sugar. We also added half a tin of tomatoes at the end to bulk things out too. We were slightly disappointed with our version, I couldn’t taste any coffee but Anthony thinks it added to the base layer of flavour. And the overall heat was much less than I had expected but it did leave me with a slightly tingly tongue! We’ll see how it develops overnight/in freezer.